User additions to AugsburgWrestling.info are currently disabled due to repeated vandalism. Please contact us to create an account and start editing. a free encyclopedia that anyone can edit. You can help, please visit the Community portal for articles you can create. Donny Longendyke is a 285 pound Augsburg wrestler. 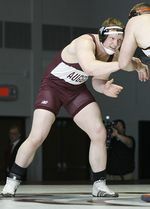 Longendyke won the 2015 285-pound national title for Augsburg. Longendyke joined the Auggies in the spring 2015 semester after transferring from Div. I Nebraska-Lincoln. Longendyke was a two-time Class AAA Minnesota State Champion at heavyweight, winning both the 2010 and 2011 titles. As a senior in high school, he was ranked first nationally at heavyweight and later earned Nebraska's Redshirt of the Year award going 34-10 in open competition. Tanner Vassar during a match against Wartburg on February 2, 2017. The Augsburg Wrestling Wiki is a user-editable encyclopedia about the Augsburg College wrestling program. The Augsburg wrestling team, founded in 1949, and first coached by Edor Nelson had humble beginnings compared the later successes. It took 13 season for the team to achieve what was to later be a given: a Minnesota Intercollegiate Athletic Conference title. 11 more years, coach Ron Pfeffer guided the team to school-best seventh place national finish and Pat Marcy claimed the 1972 NAIA 150 pound title. In 1980, an Augsburg graduate from the year before, Jeff Swenson took over the program's reigns. Under Swenson, Augsburg claimed 10 National Championships and had 29 individual titlists. After retiring in 2007 after 25 years at the head of the program, Swenson retired as head coach. Assisted head coach Sam Barber headed the program for one season. After Barber left the program Mark Matzek took over, winning the 2010 National Championship while having three individual titlists. This page was last edited on 6 February 2017, at 23:07. Content is available under the Attribution 3.0 Unported license.